If "PDF" files on the Cross Vermont Trail website are not opening when you click on them, you may need to get a copy of the free "reader" program that makes them work. Go to http://get.adobe.com/reader for a free, easy copy of the Adobe Reader program. Also good for updated copy if you have an old version. PDF's are easy to print. "It's like sending a piece of paper through the lines." 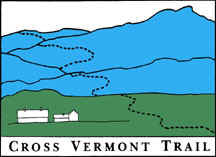 Cross Vermont Trail maps and cue sheets are PDF's so that you can simply hit print and head out on the trail. If you have Reader, click on the link to a PDF and it should open like any web page. In addition, you will see the Adobe Reader toolbar displayed. Look on the toolbar for standard buttons to print, save to your home computer, etc. However, if all this is not working out so smoothly for you, contact us and let us know. We'll make sure you get copies of the maps!